ISBN 9781934163542. 9 x 12 inches. 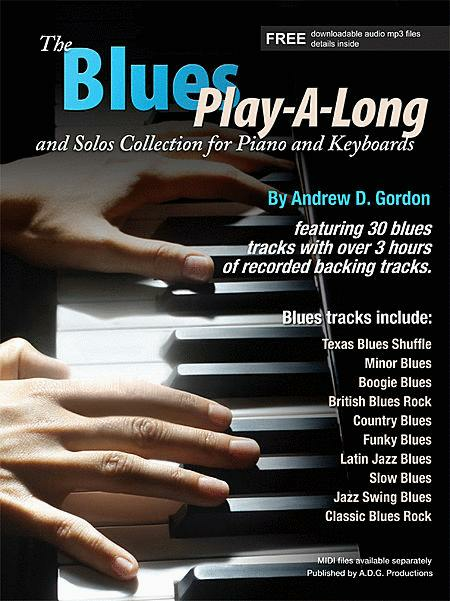 The Blues Play-A-Long and Solos Collection for Piano/Keyboards by Andrew D. Gordon consists of 30, 12bar blues play-a-long backing tracks created in various Blues styles, keys and tempos such as: Funky Blues, Boogie Blues, Jazz Blues, Minor Blues, Country Blues, Latin Blues, Old Time Jazz Blues, Jazz Swing Blues, Classic Blues Rock, Soulful Blues, Slow Blues and many more. Each of the 30 play-a-long tracks has been recorded with 12 choruses of the 12 bar blues progression giving you ample time to practice soloing techniques totaling over 3 hours of music. The inside front cover of the book gives a link to download the free audio files for the book. The 30 Blues styles contains 3 solo improvisational melody lines each of which are 12 measures in length, ranging from a basic solo and increasing in skill level designed for musicians/music students of all levels totaling 90 solos. Also, there is a rhythm keyboard chart so that you can play a rhythm keyboard part for each Blues style. 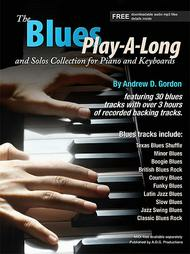 Using this book will help you on your way to becoming a great sounding blues pianist/keyboard player. Blues is the basis of many forms of music and these tracks have been specifically arranged to include styles such as: Jazz, Funk, Folk, Country, Latin, Rock, Gospel, Pop, Boogie, giving you a well-rounded selection of musical styles based on the Blues.